When I was first diagnosed with fibromyalgia twelve years ago, I read everything I could find about enhancing one's health through natural products and foods. That led me to gradually but drastically change my diet. My health improved. But that diet went out the window after big changes came in the form of motherhood, post-partum depression and back-to-work, leaving me depleted of energy and with limited time. Lately, I have been taking steps to improve my health by exercising regularly and eating better. Which is one of the reasons I looked so forward to reading Whole Foods to Thrive, and I was not disappointed! Reading this book has given me the boost I needed. I think most people know on a conscious level that eating plant-based foods is good for you, but Brazier showed me through this book that it is the basis for healthy and conscientious living. I read this book with a highlighter in hand. I learned many things, one of which explained my problem of low body pH because of my high consumption of acid-forming foods. I had several revelations reading this book, and now I know the exact changes I have to make to feel better. 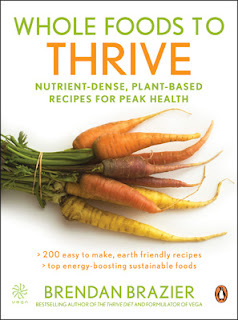 In the first part of the book (about a third of the book) Brazier explains what nutritional stress is, why nutrient density matters, the environmental toll of food production (very eye-opening), the eight components of good nutrition, and what whole foods to include in the pantry. Apart from the fact that this book is well-researched (contains extensive notes and resources) it is well-written, and well organized. In a non-fiction resource guide, this is important to me for fast and easy reference. Interspersed throughout are also charts, summary boxes, text boxes, and icons representing the eight components when discussing essential foods to include in your grocery shopping. These foods are also the main ingredients in the recipes. The last two thirds of the book consists of the 200 recipes that are labelled easy-to-make and earth friendly. They are vegetarian, of course, and without allergen foods such as dairy or wheat. My son is intolerant to these foods, and I eagerly searched for recipes for him such as the one you will see below this review. I have to admit there are some ingredients that I've never tried before, such as sacha inchi, chia seeds, maca, kombucha and hemp oil. I adapted some recipes and used others as inspiration to spice up my own cooking ideas. However, this book is different from the other allergen-free recipe books I have in that it only contains nutrient-dense plant-based foods. I liked that it is this specific. There are no pictures accompanying the recipes, though, so I sometimes wondered if my dishes look like what they were supposed to. I feel that Brazier has equipped me not only with knowledge of proper nutrition and its lasting benefits, but also recipes and resources to start incorporating it into my life. This is a book I will refer to many times and savour as I put into practice good eating habits. I also have a sister who is vegan and I'm going to love sharing these recipes with her. I recommend this book to vegetarians, wanna-be vegetarians, environmentalists, athletes, and anyone concerned with their health and welfare. Highly recommended! 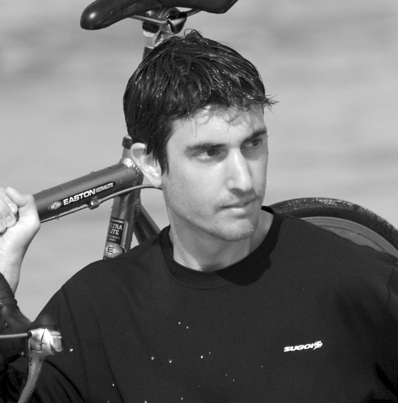 Brendan Brazier is one of only a few professional athletes in the world whose diet is 100 percent plant based. He’s a professional Ironman triathlete, bestselling author on performance nutrition, and the creator of an award-winning line of whole food nutritional products called Vega. He is also the 2003 and 2006 Canadian 50km Ultra Marathon Champion. Nominated in 2006 for the Manning Innovation Award, Canada’s most prestigious award for innovation, Brendan was short-listed for the formulation of Vega. Brendan is from North Vancouver, BC. But spends most of his time on the road touring. Rich in protein and omega-3, this smoothie will keep you going for hours with sustainable, non-stimulating energy. 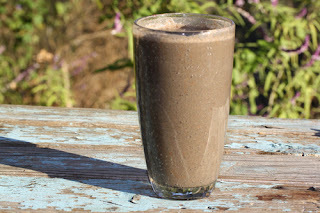 • In a blender, combine all ingredients and blend until smooth. Thanks to Vega and Penguin Canada I have one prize pack containing six Vega smoothie mixes (either Shake & Go Smoothie mixes or Complete Whole Food Health Optimizer mixes) in an assortment of flavours like Vanilla Chai, Bodacious Berry, and Choc-a-Lot. 1) Open to CANADA only. 3) Giveaway ends June 10, 2011. Each extra entry must be a separate comment. 2) Like me on Facebook and leave me a comment telling me you did. 3) Follow me on Twitter and leave me a comment telling me you did. Disclosure: Thanks to Bronwyn Kienapple from Penguin Canada for sending me this book for review. I was not compensated in any other way, nor told how to rate or review this product. I would like to win because all the flavors sound amazing! I would love to try them. I'd love to win this for my mom! This was a great book :) she could use these as a great start to her day. I would love to try these, as my sister who is a vegan, has suggested the Vega products before. I would love to these recipes, they sound delish! I would like to revamp my diet, and my entire approach to food. I did this many years ago, and have since gotten off track. I think using the Vega products would be a real boost to the changes I want to make. So, I hope to win! Cheers.